The Quran states that God decreed punishments over him and his people. These punishments came in the form of floods that demolished their dwellings, swarms of locust that destroyed the crops, pestilence of lice that made their life miserable, toads that croaked and sprang everywhere, and the turning of all drinking water into blood. Each time the Pharaoh was subjected to humiliation, his defiance became greater. 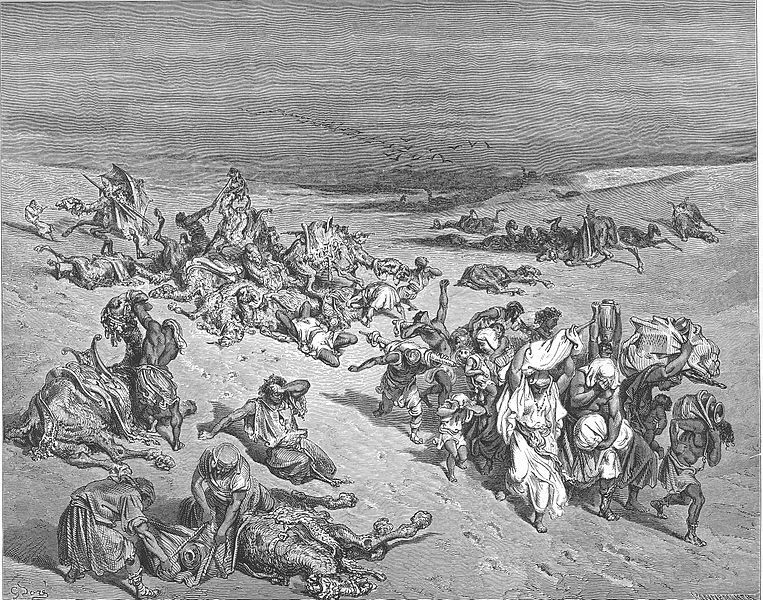 The Quran mentions that God instructed Moses to travel at night with the Israelites, and warned them that they would be pursued. In Islam there are five plagues i.e. floods, locusts, lice, toads and turning of drinking water in to blood, while in Bible there are ten plagues i.e. water in to blood, frogs, lice, wild animals, diseased livestock boils, storms of fire, locusts, darkness and death of firstborn. 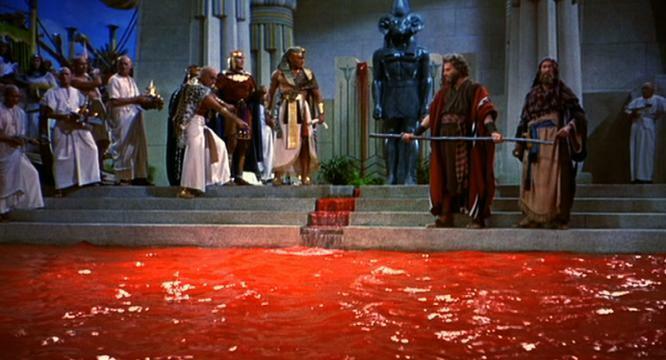 Water turning into blood, scene from 1959 movie "Ten Commandments" Moses and Aaron on the right, Pharaoh Ramesses II and courtesans on the left. 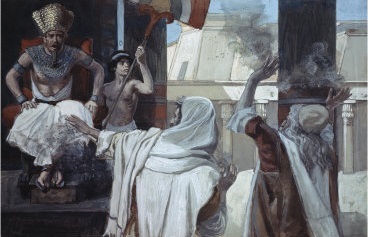 When Pharaoh persisted in his refusal to: liberate the children of Israel, Moses and Aaron warned him that G‑d would punish both him and his people. First, the waters of the land of Egypt were to be turned into blood. Moses walked with Aaron to the brink of the river. There Aaron raised his staff, struck the water, and converted them into streams of blood. The second plague of Egypt was frogs. God commanded Moses to tell Aaron to stretch the staff over the water, and hordes of frogs came and overran Egypt. 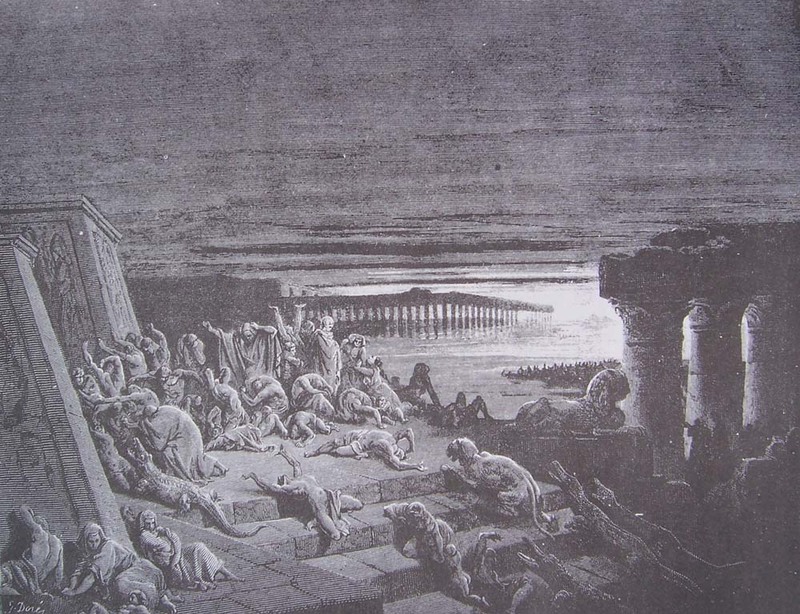 After due warning, the second plague came to Egypt. Aaron stretched forth his hand over the waters of Egypt, and frogs swarmed forth. They covered every inch of land and entered the houses and bedrooms; wherever an Egyptian turned, whatever he touched, he found there the slimy bodies of frogs, the croakings of which filled the air. The third plague of Egypt was lice. Then G‑d ordered Aaron to strike the dust of the earth with his staff, and no sooner did he do so than all over Egypt bugs crawled forth from the dust to cover the land. Man and beast suffered untold misery from this terrible plague. The fourth plague of Egypt was swarms of flies. 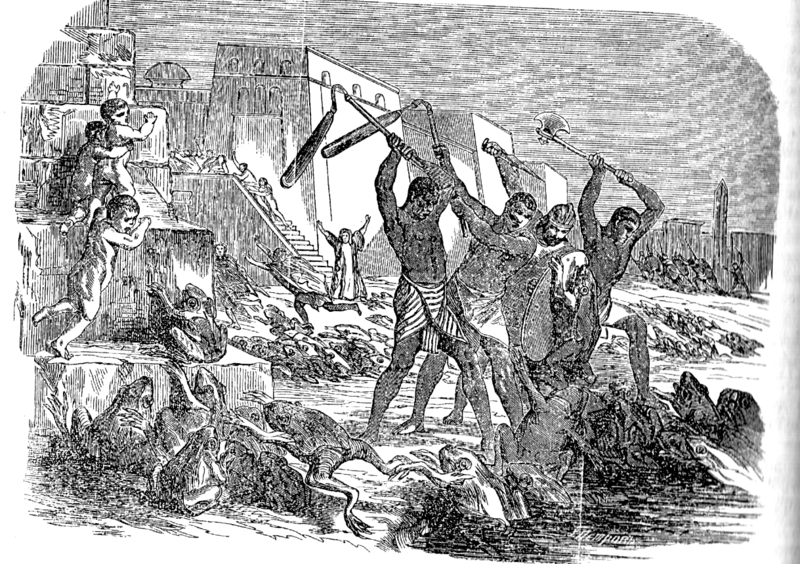 The fourth plague to harass the Egyptians consisted of hordes of wild animals roving all over the country, and destroying everything in their path. Only the province of Goshen where the children of Israel dwelt was immune from this as well as from the other plagues. 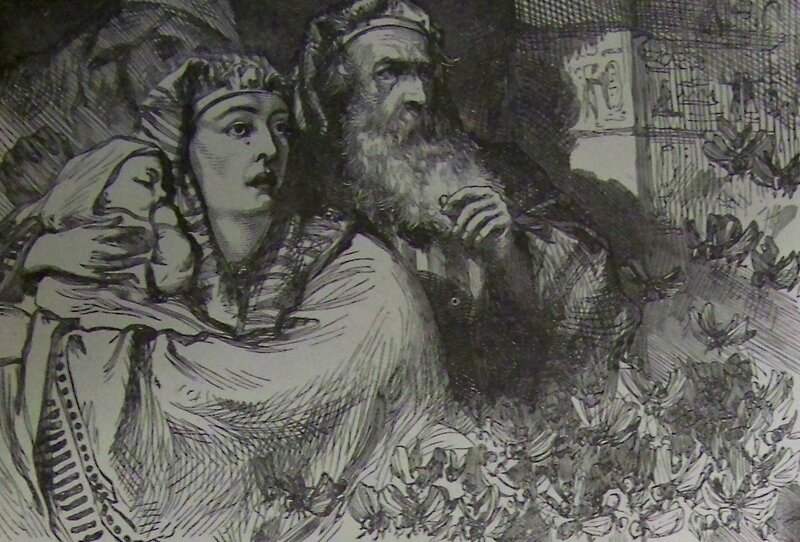 Fifth plague of Egypt was diseased livestock, from Dore's English Bible. Then G‑d sent a fatal pestilence that killed most of the domestic animals of the Egyptians. How the people must have grieved when they saw their stately horses, the pride of Egypt, perish; when all the cattle of the fields were stricken at the word of Moses; and when the animals upon which they looked as gods died smitten by the plague! They had, moreover, the mortification of seeing the beasts of the Israelites unhurt. 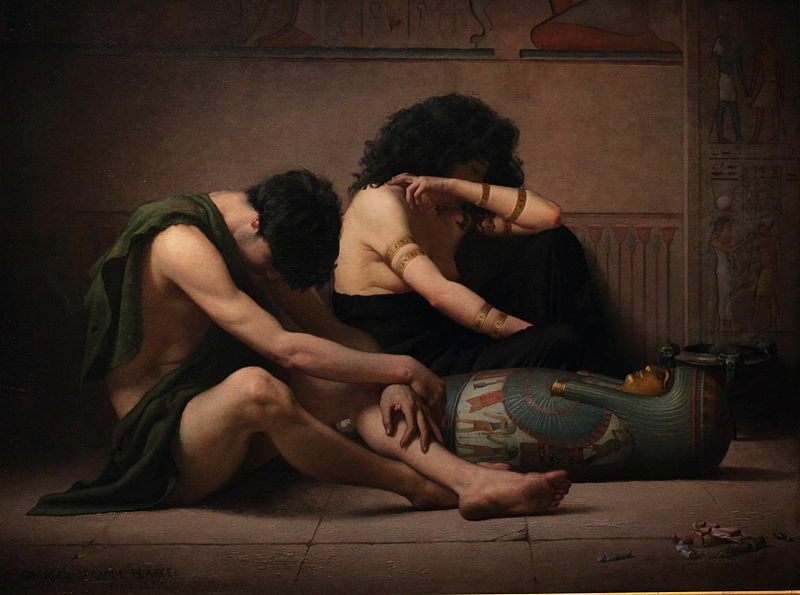 The sixth plague of Egypt was a kind of skin disease, usually translated to English as "boils". Then followed the sixth plague, which was so painful and horrible that it must have struck the people of Egypt with horror and agony. G‑d commanded Moses to take soot from the furnaces, and to sprinkle it towards heaven; and as Moses did so, boils burst forth upon man and beast throughout the land of Egypt. Floods (hail and fire storm), The Seventh Plague, John Martin, 1823. Now, Moses announced to the king that a hail-storm of unprecedented violence was to sweep the land; no living thing, no tree, no herb was to escape its fury unhurt; safety was to be found only in the shelter of the houses; those, therefore, who believed and were afraid might keep in their homes, and drive their cattle into the sheds. Some of the Egyptians took this counsel to heart; but the reckless and the stubborn left their cattle with their servants in the fields. Locusts was the the eighth plague of Egypt. 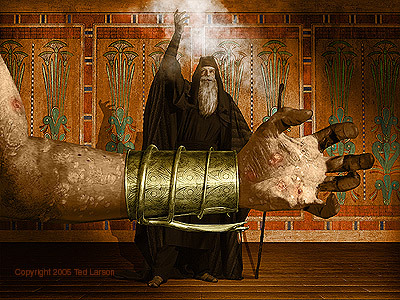 God told Moses to stretch out his hand over the land of Egypt to bring a plague of locusts. The locusts covered the face of the land and swallowed up every crop and all the fruits of the trees. Afterwards there was nothing green in the trees, and all the crops in the fields had been destroyed. 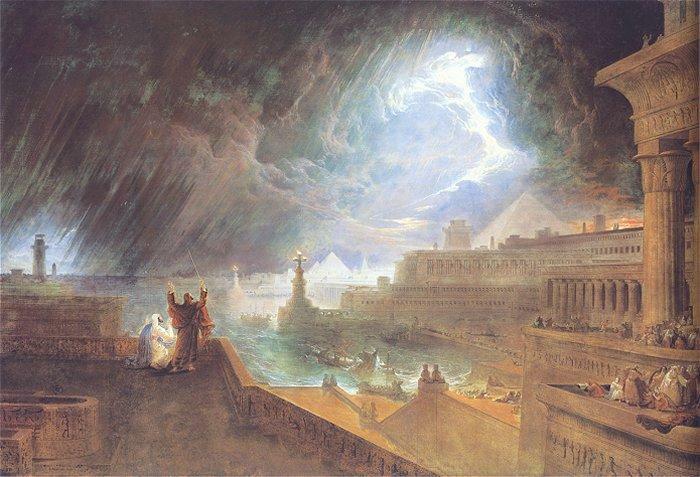 Darkness was the the ninth plague of Egypt. Moses stretched forth his hand toward heaven, and there was a thick darkness over the land of Egypt. This darkness was so total that the Egyptians had to feel their way around. Then Pharaoh offered to set the Israelites free, on condition that they let their sheep and cattle remain. But the Israelites needed their animals to sacrifice to god, so they rejected Pharaoh's condition. Death of the firstborn was the the tenth and the final plague of Egypt. 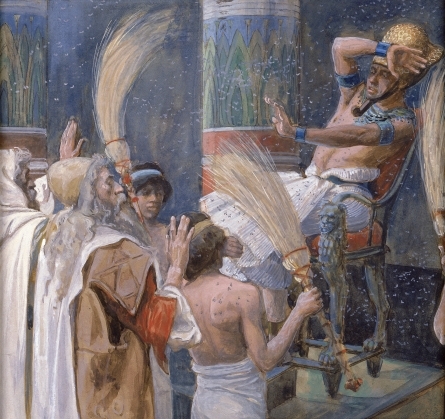 Pharaoh was warned that the tenth and final plague would be the most devastating. God told the Hebrews to sacrifice lambs and eat the meat before morning, but not before they used the blood to paint their doorposts. The Hebrews followed these directions and also asked for and received all the gold, silver, jewelry, and clothes from the Egyptians. These treasures would later be used for the tabernacle. Over the night, an angel came and passed over all of the Hebrew homes. The firstborn in every Egyptian household would die, including Pharaoh's son. This caused such a clamor that Pharaoh ordered the Hebrews to leave and take all they owned.